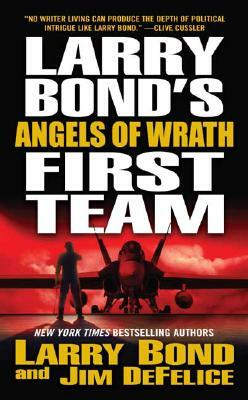 New York Times bestselling authors Larry Bond and Jim DeFelice deliver fresh thrills and unexpected twists in this latest installment of their electrifying series, Larry Bond's First Team: Angels of Wrath. Led by CIA agent par excellence Bob Ferguson, the Team pitches in to help the FBI investigate a radical group of zealots who want to create a "post-Christian" era by instigating a catastrophic showdown in Jerusalem. But Ferg and company soon discover the cult has strange connections to the Iraqi resistance and to a Syrian arms dealer. Enlisting the help of Thera Majed, a beautiful paramilitary and an expert on Middle eastern relations, the team breaks up to track each link. They seek to stop anything catastrophic from happening before the President arrives in Iraq for the next round of elections. Their quarries lead Team members into an immensely complicated world of fanatical terrorists, each potentially dangerous. . . but who among them is the next to strike? Uncertain of the most imminent threat, the Team finds that they have landed in the midst of an operation headed by Israel's famous Mossad, and are ordered to cooperate with the Israelis . . . but are the Israelis cooperating with them? Unsure of their allies, the Team realizes that they are on the trail of two completely different attacks whose targets are thousands of miles apart. Both operations are intended to trigger a vast religious war. With the clock ticking down, can the team extinguish the spark of Armageddon? At the Publisher's request, this title is being sold without Digital Rights Management Software (DRM) applied.